In a major relief to former Uttar Pradesh Chief Minister Mayawati, the Supreme Court today quashed a corruption case against her and pulled up the CBI for targeting her. Bowing to unrelenting pressure from the ruling AIADMK and other political parties in Tamil Nadu, the Centre has decided to move Sri Lankan Air Force trainees from the Tambaram Air Force Station near Chennai. A specialised laboratory equipped to check contamination of groundwater by uranium and other heavy metals will be set up. The External Affairs Ministry has taken up the case of Burundi student Yannick, who was severly beaten up in Jalandhar three months ago and has since been in coma, with the Punjab Government. The police has stepped up efforts to arrest the third accused in the case of assault on a foreign student of Lovely Professional University. Treading cautiously on the contentious issues related to spectrum pricing, the government today reconstituted the Empowered Group of Ministers (EGoM) panel on Telecom, which will look into spectrum issues, and has now appointed Home Minister P Chidambaram as its head. 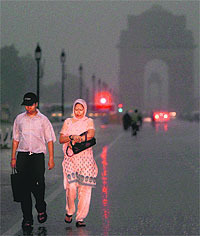 Monsoon has finally arrived in the region, bringing the much-required relief to Chandigarh and parts of Punjab, Haryana, Jammu and Kashmir and east Rajasthan. The northern limit of monsoon (NLM) is at present passing through Jamnagar, Ahmedabad, Jaipur, Aligarh, Chandigarh and Amritsar and is just about on the doorstep of Delhi.